On a scale of one to awesome, pancakes are right up there alongside BYO restaurants and snagging the last Tim Tam (simple pleasures people), especially on pancake day (Shrove Tuesday for the believers out there). Soft, fluffy and preferably soaked in syrup, they’re kind of the ultimate breakfast (or even dinner) for sweet fiends. And now that bacon on pancakes is a a totally acceptable thing, we’ve gone a little mad for them. 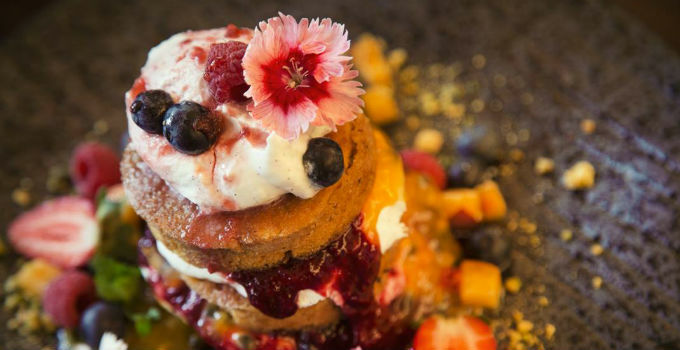 So batter up, because here are a few spots serving up the best pancakes Brisbane has to offer. For those without a sweet tooth (say what? ), Grub Street does a mean savoury carrot pancake number. Served alongside a scrummy pea puree, spinach, haloumi and red pepper relish, this may just become your new favourite breakfast. Allergen sufferers take note, the lovely chefs can make these gluten and/or dairy free on request. Just like a hot bath, a hug, or a jar of Nutella (anyone? 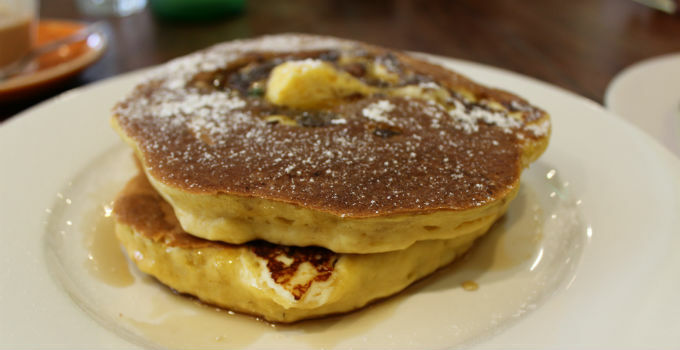 ), the ricotta hot cakes at Sassafras are medicine for the soul – or rather the tastebuds. Plump hot cakes, smothered in maple syrup and finished with lashings of honeycomb butter (drool) – we dare you not to be happy after a rendezvous with these beauties. Searching for a unique and refreshing stack? Don’t look matcha futher, The Hamptons have the perfect solution for you. With candied ginger ice-cream, red velvet crumble and wild berry coulis, their matcha pancakes will have everyone green with envy. If you’re after something a just ‘lil bit fancy then Crème Patisserie is right up your alley. Plating up a big stack of ricotta buttermilk pancakes with choc chip butter, maple syrup and blueberry compote or balsamic strawberries, they’ll have you drooling all over the fancy tableware in the European style cafe and bakery. The Jam Pantry has found a glorious use for their homemade jams, chutneys and sauces – generously dollop them on pancakes! 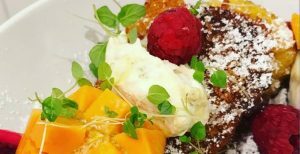 Ricotta pancakes with mango cheeks and passion fruit curd had us in ecstasy on a recent Saturday morning but you might find some other sweet stack when you visit as the menu changes monthly. Either way, there will always be pancakes. Delicious, drool-worthy, out-of-the-box pancakes. Seriously, they even have savoury pancakes. Prepare to be smothered by the pure deliciousness of the vanilla bean pancakes at Little Clive. Served with honeycomb, whipped chocolate ganache, sweet hazelnut dukkah and macerated strawberries – wait, are you conscious? Wake up! You have to go try them. If you like a bit of chocolate with your breakfast (don’t we all) then Picnic Café’s pancakes are for you. Heavily drizzled in tim tams, Nutella and strawberry jam, they’ll have you abandoning boring old eggs benedict for a sugar overdose in no time. The only problem we have with our favourite pancakes spots? We can’t get stop by when 3am hanger strikes. Lucky for us The Pancake Manor is open 24/7. Words by Sam Geldard – the gourmand who demands pancakes!